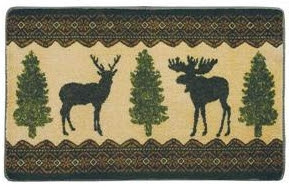 I have to start out by saying I just LOVE this Woodland Bath Mat. My son's bedroom is decorated with a hunting theme, and after finding Theme Bathroom, I think we are going to carry that over and do his entire bathroom using the same type of theme. This bath mat is so soft and cushy I just love stepping on it with my bare feet! I've never found a bath mat this thick and plush in the stores before. I think he is going to have to keep an eye on his bath mat, he may wake up one day with it missing! Or I guess I'll just have to find a theme for my bathroom, I'm thinking maybe cats or lighthouses. Either way I know where I am getting my bath mat that is for sure. Theme Decor Stores offers themes for your Bathroom, Nursery, and Kitchen. So there are a lot of great products to choose from. I personally love having a whole room theme all ready for me. I hate going from store to store trying to find all the necessary pieces, and ones that match no less. Buy it: You can find the rug I got and a lot more at Theme Bathroom. 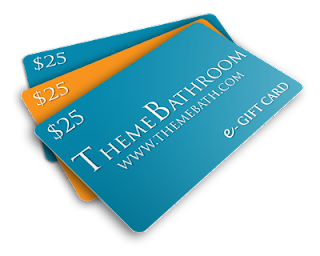 Win it: One lucky reader will win a $25 gift card to Theme Bathroom. This giveaway will end Jan 29th at 10 PM EST. The winner will have 48 hours to respond to my email. If no response, a new winner will be chosen. Open to residents of the US only. I commented on Theme Decor's facebook page. I followed on twitter @tuneintol. I liked this site on facebook. following from the weekend blog hop. hope you will stop by and follow. I visited Theme Bathroom and left a message on their wall that I like their Tulip and Lily collection. I told them Mom in Training sent me. I like Theme Bathroom on Facebook. katherinekinnaird@yahoo.come visted theme decor store and found so many that she liked but left message on the FB wall that you sent me and I went w/the campfire collection.I just have to say thx for the reveiw its pefect timing for me,just bought a new home and theme decor stores are soo helpful. I love the Sea Breeze theme. I'm following you on twitter and tweeted.. I left the message on their Facebook wall telling them my favorite was the http://www.themebath.com/country-cats-toothbrush-holder.aspx, and that you sent me! I left them a fb message. Told them what I like. I love the Harlequin Mosaic Bathroom Decor. Like Theme Decor Stores on FB. Completed the mandatory. mary Jaco. I Theme Decor on FB. Mary Jaco.